Download "Part A. 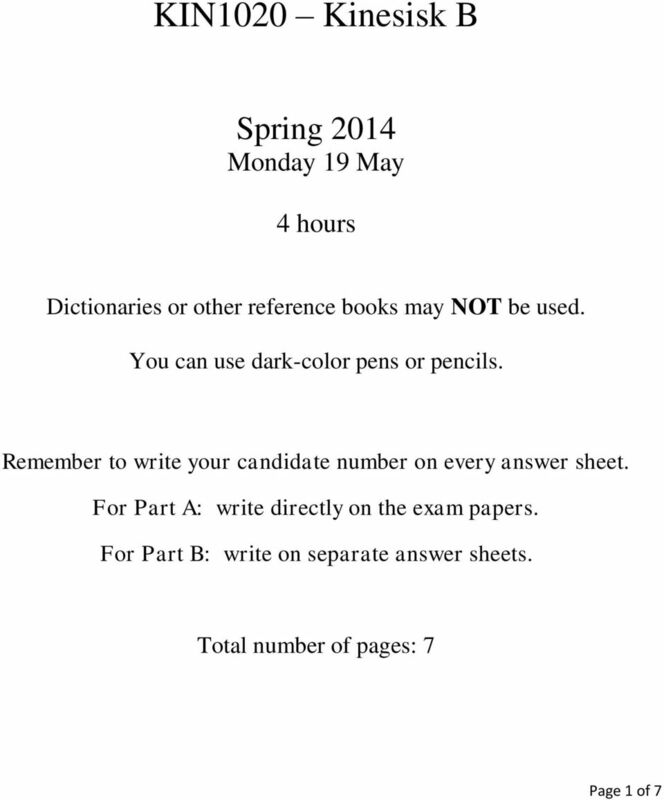 Please write this part on these exam papers (DON T write on separate papers). I. Circle the wrong characters [0.5 point each] and write the ri"
3 III. 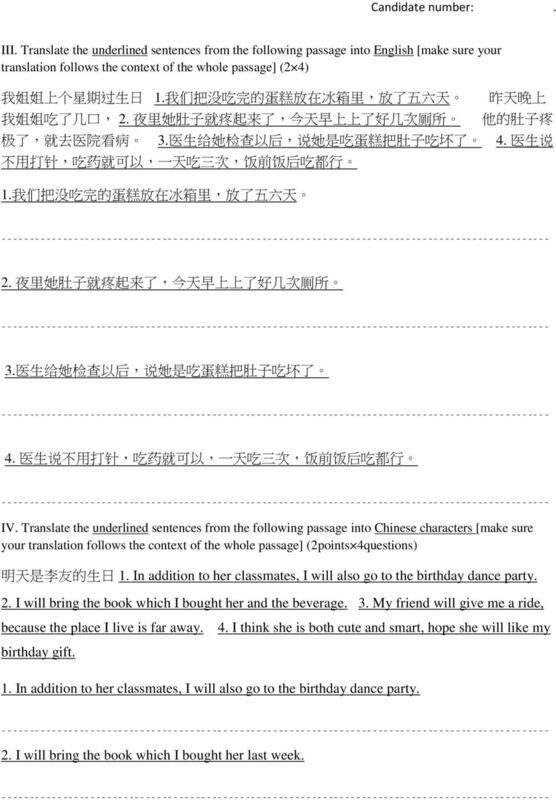 Translate the underlined sentences from the following passage into English [make sure your translation follows the context of the whole passage] (2 4) 我 姐 姐 上 个 星 期 过 生 日 1. 我 们 把 没 吃 完 的 蛋 糕 放 在 冰 箱 里, 放 了 五 六 天 我 姐 姐 吃 了 几 口, 2. 夜 里 她 肚 子 就 疼 起 来 了, 今 天 早 上 上 了 好 几 次 厕 所 极 了, 就 去 医 院 看 病 3. 医 生 给 她 检 查 以 后, 说 她 是 吃 蛋 糕 把 肚 子 吃 坏 了 不 用 打 针, 吃 药 就 可 以, 一 天 吃 三 次, 饭 前 饭 后 吃 都 行 1. 我 们 把 没 吃 完 的 蛋 糕 放 在 冰 箱 里, 放 了 五 六 天 昨 天 晚 上 他 的 肚 子 疼 4. 医 生 说 2. 夜 里 她 肚 子 就 疼 起 来 了, 今 天 早 上 上 了 好 几 次 厕 所 3. 医 生 给 她 检 查 以 后, 说 她 是 吃 蛋 糕 把 肚 子 吃 坏 了 4. 医 生 说 不 用 打 针, 吃 药 就 可 以, 一 天 吃 三 次, 饭 前 饭 后 吃 都 行 IV. Translate the underlined sentences from the following passage into Chinese characters [make sure your translation follows the context of the whole passage] (2points 4questions) 明 天 是 李 友 的 生 日 1. In addition to her classmates, I will also go to the birthday dance party. 2. I will bring the book which I bought her and the beverage. 3. My friend will give me a ride, because the place I live is far away. 4. I think she is both cute and smart, hope she will like my birthday gift. 1. In addition to her classmates, I will also go to the birthday dance party. 2. I will bring the book which I bought her last week. 4 3. My friend will give me a ride, because the place I live is far away. 4. I think she is cute, and hope she will like my birthday gift. V. Answer the questions from the map (using the term if provided) [2 5] 中 文 教 室 学 生 餐 厅 老 师 办 公 室 学 校 医 院 大 学 图 书 馆 大 学 公 园 学 生 活 动 中 心 你 在 这 里 电 脑 中 心 男 生 宿 舍 音 乐 厅 电 影 运 动 场 女 生 宿 舍 院 英 文 教 室 书 店 1. 学 生 餐 厅 在 那 儿? ( 中 间 ) 2. 老 师 办 公 室 离 图 书 馆 远 还 是 学 校 医 院 离 图 书 馆 远? ( 没 有 那 么 ) 3. 我 要 从 电 影 院 去 运 动 场 跑 步, 要 怎 么 走? 4. 我 跑 完 步, 从 运 动 场 往 学 生 餐 厅 走, 在 学 生 餐 厅 往 左 拐, 再 走 一 下 以 后, 我 的 右 边 是 5. 我 要 去 书 店 帮 朋 友 买 书, 书 店 在 什 么 地 方? 7 Part B. Please write this part on separate exam papers (DON T write on this sheet). Velg én av oppgavene under: 1. Beskriv de ulike sammenhengene hvor partiklene 的 og 得 brukes på kinesisk. 2. Hvilke forskjellige måter har man til å uttrykke sammenligninger på i kinesisk? Vel éi av oppgåvene under: 1. Gjer greie for dei ulike samanhengane der partiklane 的 og 得 blir brukt på kinesisk. 2. 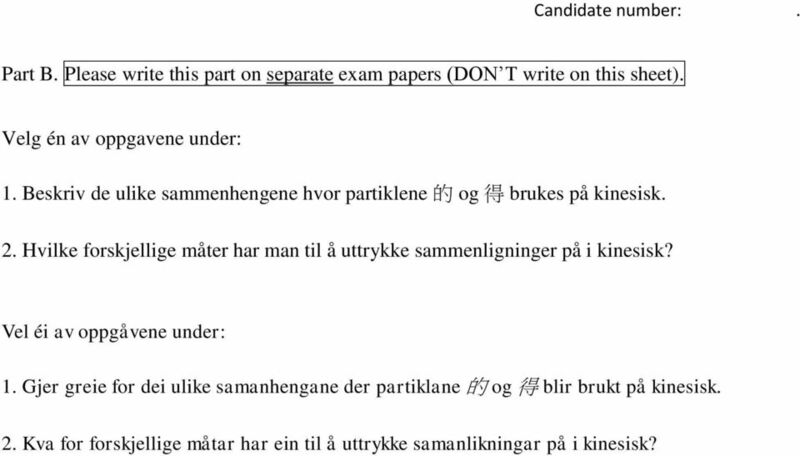 Kva for forskjellige måtar har ein til å uttrykke samanlikningar på i kinesisk? 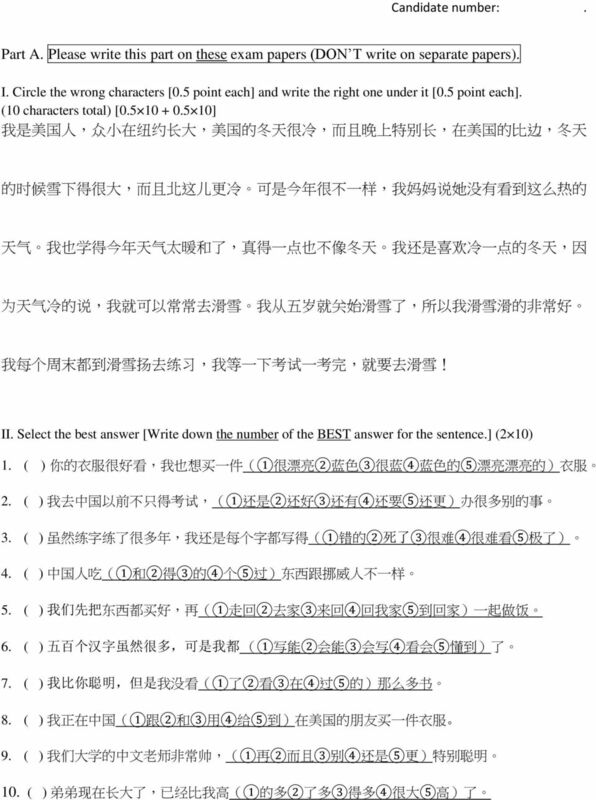 高 丽 大 学 韩 国 语 1 本 册 课 文 译 文 四 校 :2권_권권_Answer_110712 2013-11-6 23:20 页 1 课 文 译 文 第 1 课 自 我 介 绍 佐 藤 : 你 好! 我 是 佐 藤 祐 一 琳 达 : 你 好! 我 是 琳 达 泰 勒 佐 藤 : 很 高 兴 认 识 你 琳 达 : 很 高 兴 认 识 你 佐 藤 : 琳 达, 你 从 哪 个 国 家 来?